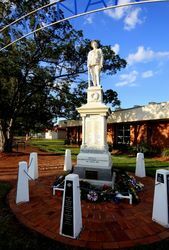 The Nanango War Memorial was originally erected by residents of Nanango and District in memory of those who served and those who died in World War One. 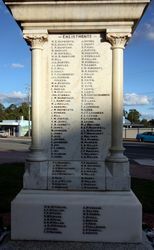 The digger of Italian marble was prepared in Italy and the pedestal on which it stands is typical of those prepared by A. Petrie and Son of Toowong. 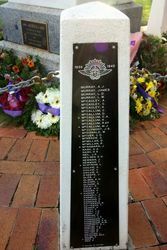 Marble plaques bear many names of those who served in World War One, with a special section for five Nurses and a Chaplain. 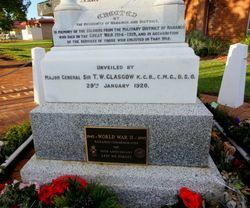 The memorial was unveiled by Major General Sir T. W. Glasgow, KCB, CMG, DSO, on the 29th January 1920. 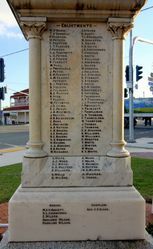 A memorial area surrounding the monument was unveiled on ANZAC Day 1967 and contains pillars which list the names of those who served in World War Two. 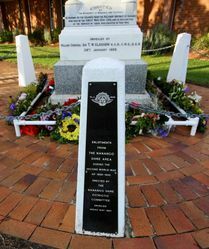 An Australia Remembers Plaque is also contained in this precinct. 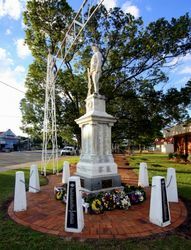 The Nanango Fallen Soldiers Memorial Committee has accepted a tender of £400 for the erection of a marble statue in Nanango. 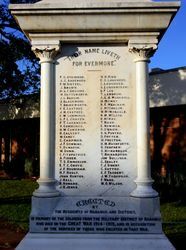 The monument is to be erected in the District Court House yard. 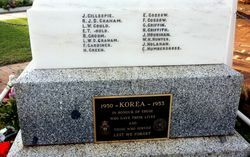 The front slab is to contain the names of the fallen men and the other three slabs will contain the names of the other enlistments of whom there were over 300. The Brisbane Courier, 19th February 1919. The Residents Of Nanango, And District. Major General Sir T. W. Glasgow K.C.B., C.M.G., D.S.O.